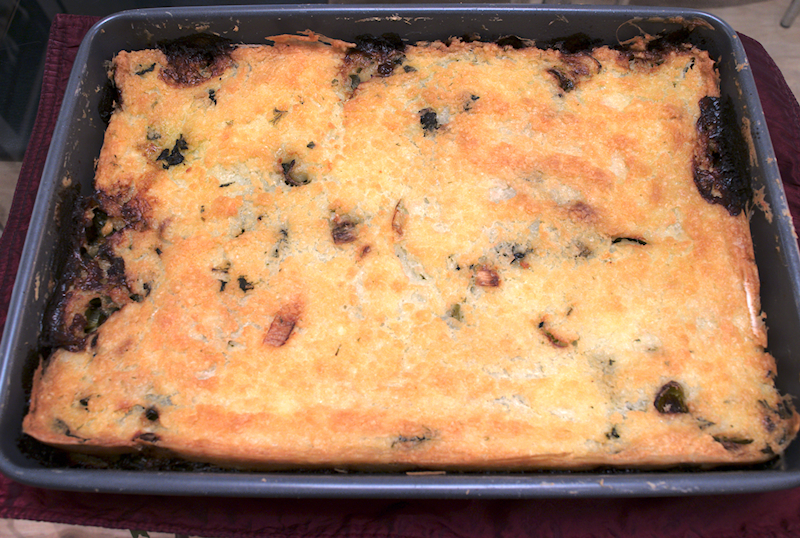 A simple but hearty alternative version of Spanakopita. 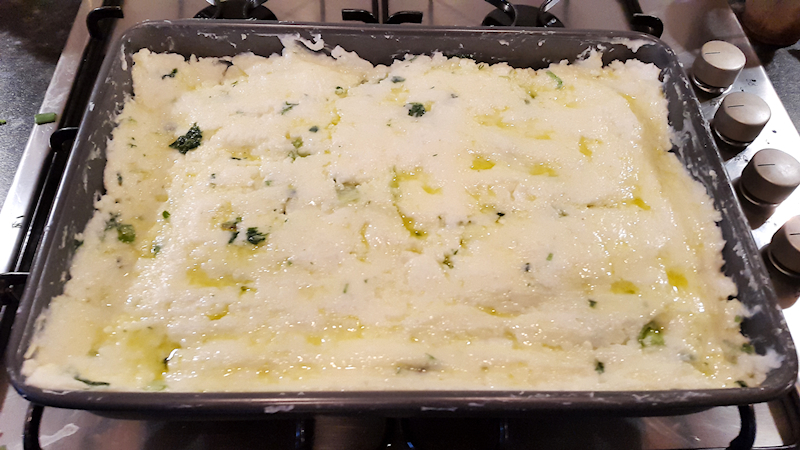 Spinach, leeks, onions and herbs covered in a corn flour batter. I am probably the biggest fan of Spanakopita. Honestly, I can eat it every day for a month or so. Or until my stomach starts complaining. 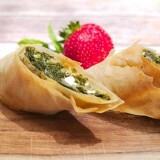 Spanakopita usually needs some kind of filo pastry, ready or home made. But this is an alternative version that uses a rough pastry (or batter) made simply with cornflour, water and milk. I would call it “the poor man’s Spanakopita”. 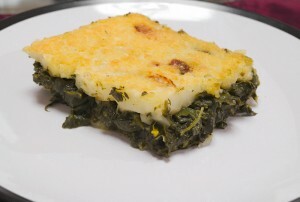 It’s based on a type of pie they make in some central parts of Greece called “Mpatzina”. Simply put all your mixture on a tray and cover it with some corn flour-based batter. A very easy and cheap way to feed a whole family, especially during times of tight budgets. 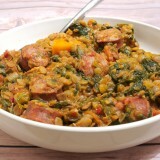 I used fresh spinach but it can be made with frozen one as well. Just avoid the “steaming” but drain it to remove all of the juices. 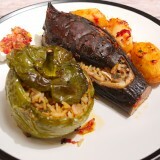 The result: a simple and healthy gastronomical pleasure! 750 gr (26 oz) fresh spinach. ~ 10 spring onions sliced. 250 gr (9 oz) Feta cheese crumbled. A bunch of flat-leaf parsley chopped. A bunch of fresh dill chopped. A small bunch of fresh mint chopped. 1 ½ cups of extra virgin olive oil. 750 gr (26 oz) corn flour. Wash the spinach, chop it roughly and steam it for a 2-3 minutes in a pot. Drain the juices and put it in a large bowl. 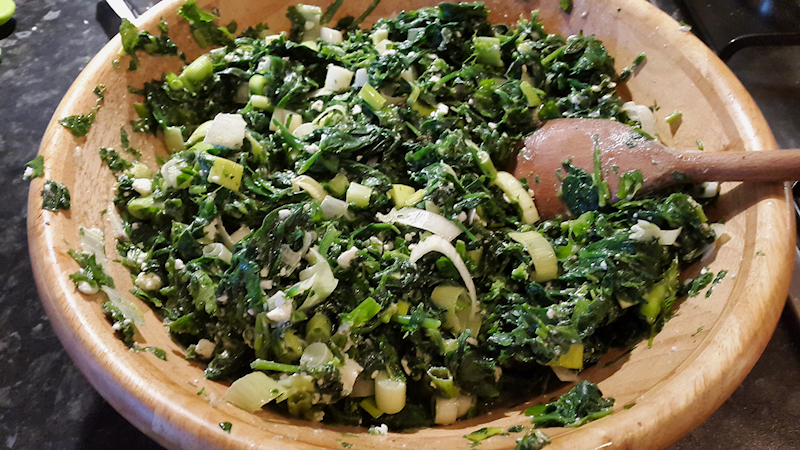 Add the leek, spring onions, herbs and Feta to the bowl. Add most of the olive oil, season with some salt (Feta is salty) and pepper and toss well. You mixture is ready. Add the corn flour in a large bowl and add 3-4 cups of hot water. Stir well for a few minutes and add the milk. Add 1 tablespoon of salt. Stir well. The end-result should be something like a thick bechamel sauce or thick batter. Preheat the oven at 200 Celsius (390 F). Spread some olive oil on the bottom and side walls of a medium tray using an kitchen brush. Use half of your flour batter and cover the bottom of the tray. 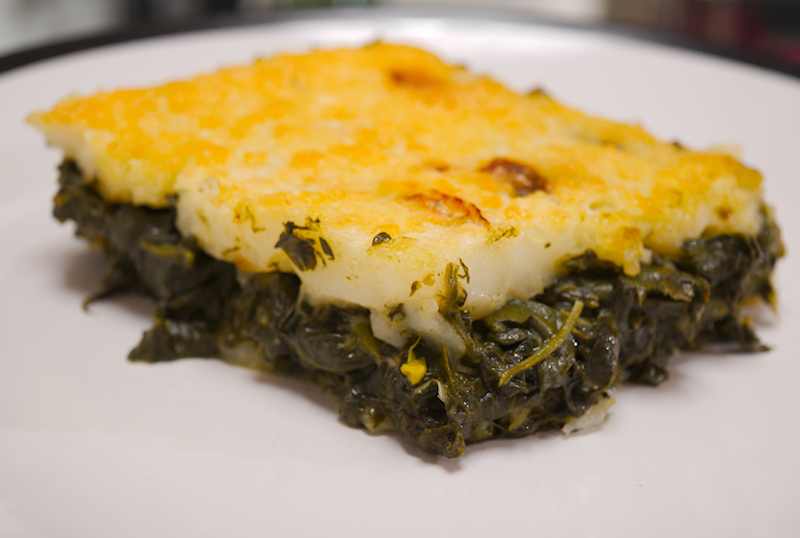 Add the spinach mixture on top and use the rest of the flour batter to cover it. Again, spread some olive oil on top. Bake for about 1 hour until your pie gets a nice golden brown color on top. Let it cool down for ~ 30 minutes before you cut it.